Algebra Tiles - A Great Hands Method For Learning Algebra. If you like the hands-on approach to teaching, then maybe you know about algebra tiles. Check out the video below to learn more about how they can help engage your algebra students. Algebra tiles are good manipulatives to give students a hands-on approach to be used in addition to the normal way it's taught in the classroom. Let's see how we can use algebraic tiles to model operations involving integers. The yellow square represents a +1 (positive 1). The red square will represent a -1 (negative 1). When you put these two squares together, their sum is zero. 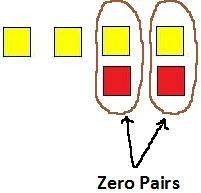 A yellow and red square together can be referred to as because as we said above when added their sum is zero. Step 1: Lay out the appropriate tiles for your addition problem. In our example of (+4) + (-2), we need to lay out four yellow squares and two red squares. Step 2: Circle the zero pairs. So below you can see we have circle two zero pairs. Step 3: Remove the zero pairs, and whatever squares you have left will be the answer to the addition problem. You will always have just one color left, either red or yellow. So in this case we have two yellow squares left. You can watch a video below to get a better idea. There are a variety of hands-on approaches to teaching algebra in the classroom or at home if you home school. Besides the regular text book methods most of us grew up on, many more teachers and schools are integrating hands-on teaching methods and finding them to be very effective. Studies have shown that when kids are more interested in the subject matter, they tend to learn material better and their retention rate also improves. Besides, if they are enjoying them selves more it makes your job that much more enjoyable.